Seven militants and a security guard have been killed after a series of bombings in China's north-western region of Xinjiang, state media says. The pre-dawn violence in southern Kuqa county targeted a police station and other government buildings. The explosions were followed by gunfire in the area, which is 3,000km (1,860 miles) from Beijing, witnesses said. Earlier this week, China said 16 policemen were killed in an attack by Islamist separatists in Xinjiang. "The lawbreakers drove a taxi to the local public security office, industry and business administration and other sites and tossed homemade explosives, destroying two police vehicles," Xinhua news agency reported. 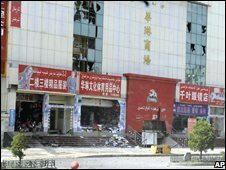 Two of the militants died in the attacks, while five were killed later by police, Xinhua news agency reported. World Uighur Congress spokesman Dilxat Raxit told the BBC that the Chinese government was responsible for the latest blasts because of what he called repressive policies in Xinjiang. "In order to stop the East Turkestan situation getting worse, I urge the international community to exert pressure on China to immediately stop its systematic repressive government policies," he said. Xinjiang is home to many Muslim Uighurs, some of whom want independence in the region they call East Turkestan. Kuqa county itself is almost exclusively populated by Uighurs. Uighur separatists in Xinjiang have waged a low-level campaign against Chinese rule for decades. The latest incident came after the Olympic Games opened in Beijing, with a spectacular display of fireworks, music and dancing. China has spoken in the past of what it calls a terrorist threat from Muslim militants in Xinjiang, but it has provided little evidence to back up its claims, correspondents say.